This is the fourth and second to last lesson as part of the sharp and flat harmonic minor scales series. 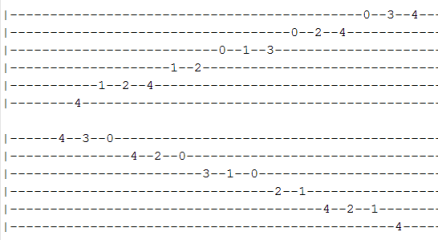 Let’s give it up for the G#/Ab harmonic minor guitar scale. You begin by playing the root note – G#/Ab – on the 4th fret of the E6 string. Then you progress until you reach the final note of the first set on the 1st fret of the G3 string. Then you can go even further to finish the second set of the scale, which is on the 4td fret of the E1 string. Let’s try another pattern. This time you begin on the 16th fret of the E6 string, and proceed through two sets of the scale until you reach the final note on the 16th fret but of the E1 string. As with every other scale, this one helps you to familiarize yourself with different notes on the fretboard and improve the strength and flexibility of your fingers. Here’s a short video clip showing you how to play yet another pattern of the G#/Ab harmonic minor scale. It starts with the same note as the first pattern presented in this lesson. If you want to learn more you can visit all-guitar-chords.com and get the full pattern for the G#/Ab harmonic minor scale (click here).